In honour of the Offshore Technology Conference, each year, World Pipelines’ April issue includes updates from oil and gas pipeline companies working offshore around the world. In addition to the issue’s general offshore focus, a number of companies are invited to participate in the annual Offshore Technology Review, which offers insights into global offshore pipeline activities. Read on to see what McDermott has been up to. "McDermott – offshore technology review"
One of the biggest challenges facing the offshore oil and gas industry has been the tremendous drop in oil prices. While lower prices have led to cancelled and delayed projects, this change also brings opportunities. Since installing the first large diameter concrete coated pipeline offshore in the Gulf of Mexico (GoM) in 1951 and completing the first J-lay in 1994, McDermott provides fully vertically integrated solutions and pipeline engineering, procurement, construction and installation (EPCI) services for both greenfield and brownfield developments. The company can recognise constructability and installation challenges to provide cost, schedule and execution certainty for projects. Offering inspection, repair and maintenance services, as well as pipeline integrity studies, McDermott can provide an effective total solution to its customers in the offshore and, specifically, the subsea umbilicals, risers and flowlines (SURF) sectors. The company applies its experience to transportation and installation (T&I) pipeline projects, offering an ‘added value’ perspective that is missing from single purpose companies. McDermott currently has pipeline projects in three major areas: the Middle East; Asia; and the Americas, Europe and Africa. The company’s fleet of vessels is capable of laying pipelines at all water depths. While its Derrick Barge 32 is used for shallow water projects, its Derrick Barge 27 and Derrick Barge 30 and the Lay Vessel North Ocean 105 (LVNO 105) are capable of reeling rigid pipe-in-pipe in deepwater. McDermott’s new build Derrick Lay Vessel 2000 (DLV 2000) is used for large diameter S-lay in deepwaters. Both the LVNO 105 and DLV 2000 are dynamic positioning vessels. In the Middle East, McDermott is installing pipelines of various sizes and lengths for its clients in the region. Its largest Middle East customer is Saudi Aramco, for which pipelines are just a part of the overall project scope. Meanwhile, in Asia, McDermott is currently installing flexible flowlines using its Lay Vessel 108 on the Ichthys LNG project. The Vashishta and S1 gas fields off the east coast of India are being developed by India’s Oil & Natural Gas Corp.as part of a deepwater development project. A McDermott and L&T Hydrocarbon Wngineering team are building the major subsea field infrastructure under an EPCI contract. A pipeline has been S-laid by McDermott’s Derrick Barge 30, to water depths of approximately 215 m, and the pipeline sections (including pipeline end terminations and inline tees) will be reel laid by McDermott’s LVNO 105 from water depths of 215 - 700 m.
In 2015, McDermott developed its spoolbase at Gulfport (Mississippi), which has been used for the Otis, Sercan and Cesar Tonga projects. In terms of spoolbase operations, 2016 was a successful year for McDermott and solidified the company’s T&I position in the GoM. 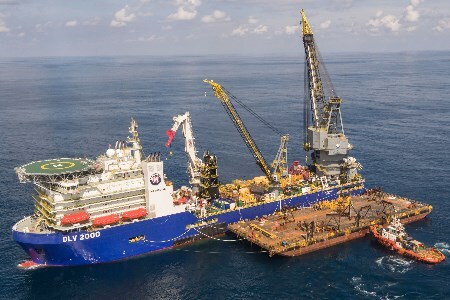 The facility delivered over 30 480 m of pipe to the LVNO 105, which were then installed in the GoM and offshore Trinidad. Moreover, both the Julia and the Caesar Tonga fields have utilised McDermott’s Lay Vessel North Ocean 102 for umbilical and ancillary equipment installation. Further spooling and pipelay operations are planned for 2017. You can find McDermott at OTC 2017 at booth #2627. Additional information can be found on McDermott's website. The image is provided courtesy of McDermott, and shows McDermott's DLV 2000 installing a 42. in. dia. spool on the Ichthys LNG project.